Japanese encephalitis (JE) and malaria would coexist in the areas where both illnesses are endemic with overlapping clinical pictures, especially in a case of febrile encephalopathy with hepatosplenomegaly. However, there are no published data till date showing concurrent infection of these two agents despite both diseases being coendemic in many areas. We report a case of concurrent infection of JE and mixed plasmodium infection, where the case, initially diagnosed as cerebral malaria did not improve on antimalarials and alternative diagnosis of JEV encephalitis was thought which was confirmed by a serological test. To the best of our knowledge, this is the first case report of concurrent Japanese encephalitis with mixed plasmodium infection. We report a case of 3-year-old male child, who presented with febrile encephalopathy with hepatosplenomegaly. Based on a rapid diagnostic test and peripheral smear examination, a diagnosis of mixed P.Vivax and P.falciparum infection was made and the patient was treated with quinine and doxycycline. However, besides giving antimalarials the patient did not improve and an alternative diagnosis of JE was considered as the patient was from the endemic zone of Japanese encephalitis. Cerebrospinal fluid (CSF) of the patient was sent for a virological study which came out to be positive for JE IgM in CSF, which is confirmatory of JE infection. In a patient with febrile encephalopathy with hepatosplenomegaly especially in areas coendemic for JE and malaria, the possibility of mixed infection should be kept in mind. The Japanese encephalitis (JE) virus, a mosquito born flavivirus, is the largest cause of epidemics in a large part of Southeast Asia. The disease is typically an acute neurological syndrome, characterized by fever, convulsions, headache, focal neurological sign, and decreased consciousness. We report a case of concurrent infection of Japanese encephalitis and mixed malarial parasites, where JE was diagnosed by detection of JE IgM in cerebrospinal fluid (CSF) and malarial infection were diagnosed by a rapid diagnostic test followed by peripheral blood smear examination. A 3-year-old male child resident of Gorakhpur was admitted with complaints of fever for 12 days which was high grade, convulsions (generalized tonic clonic) for 6 days and altered sensorium for 1 day. Examination revealed a febrile child with temperature of 103° F, pulse of 158/min which was feeble, RR of 54/min, blood pressure of 56/32 mm Hg, and Glasgow coma score of 4. Systemic examination revealed hepatosplenomegaly, bilateral rhonchi in chest, tachypnea, tachycardia, extensor planters, and diminished deep tendon reflexes. Investigation of the patient revealed hemoglobin of 9.5 g%, normal cell count and platelet count of 1.8 lakh/ mm 3 , SGPT of 109 U/ll, urea of 87 mg% and blood glucose of 50 mg%. The CSF study showed a total cell count of 68 cells/ mm 3 with 72% lymphocytes and CSF protein of 68 mg% with normal sugar level. As the patient was having long duration of fever with hepatosplenomegaly a clinical suspicion of cerebral malaria as a cause of febrile encephalopathy was made and a rapid diagnostic test for malarial parasites was performed which was positive for both P.vivax and P.falciparum. 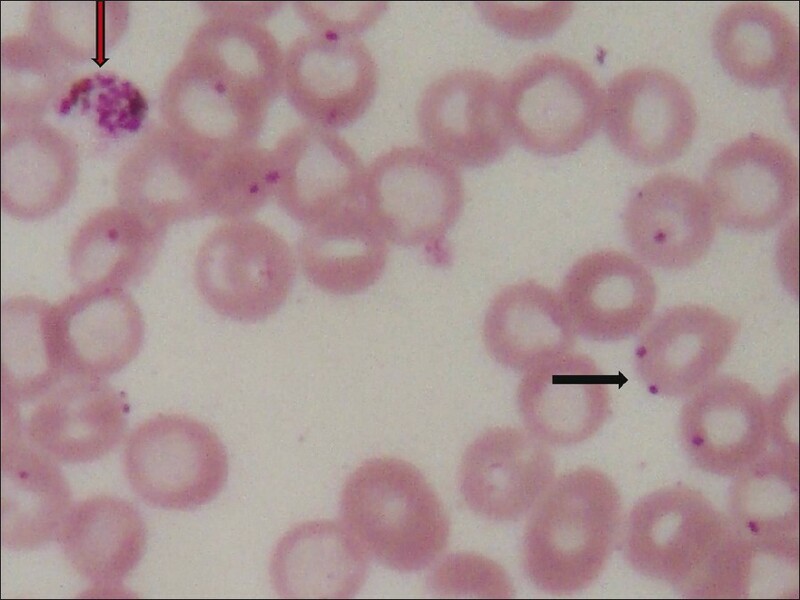 Peripheral blood smear, both thick and thin film, was sent which showed the presence of both P.vivax and P.falciparum (parasitic count of 6%) [Figure 1]. The Widal test and viral markers for acute hepatitis were negative and blood cultures were sterile. X-ray chest showed right-sided heterogeneous lung opacities and CT scan head done on the third day was normal. The patient was put on a 7-day course of intravenous quinine and doxycycline. However, fever of the patient persisted even on day 8 of admission. Repeat peripheral smear on day 7 of antimalarial treatment was negative for malarial parasite. As the patient was from a JE endemic area (Gorakhpur) and hepatosplenomegaly with deranged renal functions can also occur in JEV encephalitis, a differential diagnosis of JEV encephalitis was kept in mind and CSF of the patient was sent for a virological study. The CSF sample was tested for the presence of IgM antibodies to JEV. CSF was subjected to reverse transcriptase polymerase chain reaction (RT-PCR) for detection of entero virus genome and JE virus genome. Serum samples were tested for rise in antibody titer for Coxsackie virus, Enterovirus 76, West Nile virus, and JE virus. CSF of the patient showed only the presence of JE IgM in CSF which confirmed JEV encephalitis in our patient. All other virological tests showed negative results. The patient was managed symptomatically, shock was treated with ionotropes following which shock improved, and phenytoin was given for seizures and primaquine for radical cure. The child started improving and by the 13th day, fever subsided, blood urea became normal, GCS improved to 12, and repeat peripheral blood smear was negative for malaria parasite. The patient was discharged on day 28 of admission without any sequel. The patient is well on follow-up. Infection with Japanese encephalitis virus may be asymptomatic, or may cause meningitis, encephalitis, or myelitis. Encephalitis is the most common presentation and is indistinguishable from other causes of acute encephalitis syndrome (AES). Syndromic surveillance therefore aims to identify patients of AES and, among these, confirm JEV infection using standardized laboratory tests. In the full-blown encephalitic form, onset is rapid, beginning with a 2- to 4-day prodrome of headache, fever, chills, anorexia, nausea and vomiting, dizziness, and drowsiness. These symptoms are followed by nuchal rigidity, photophobia, altered consciousness, and hyperexcitability. In a study by Kumar et al.,  hepatomegaly (22.1%), splenomegaly (5.2%), and deranged liver enzymes and deranged renal function tests have been reported in laboratory-confirmed JE cases. Keeping this possibility in mind, we tested our patient for JEV encephalitis and CSF was sent for real-time PCR and JE IgM in CSF. The case study is important as we exclude many cases of Japanese encephalitis in which presentation is not acute, diagnosing them as cerebral malaria without an advance test for JE virus isolation, such as real-time PCR or detection of JE viral genome in CSF. However, differentiation of these cases is important for early treatment and for AES surveillance purpose in coendemic areas. In a patient with febrile encephalopathy with hepatosplenomegaly especially in areas coendemic for JE and malaria the possibility of mixed infection should be kept in mind. This case reports a rare association of two endemic infections which are not usually diagnosed simultaneously because of similar clinical and laboratory features creating diagnostic dilemma for a treating physician. The authors would like to thank Dr. MM Gore, Director, National Institute of Virology, Gorakhpur Branch for providing virological diagnosis of the patient. 1. WHO recommended standards for surveillance of selected vaccine preventable diseases standard. WHO/VandB/03.01 January, 2006. Available from: http://www.path.org/files/whosurveillance_standards. [Last Accessed on 2011 Jun 23]. 2. Joshi MV, Geevarghese G, Mishra AC. Epidemiology of Japanese encephalitis in India: 1954-2004. In: Mishra AC, editor. NIV Commemorative Compendium. Pune: Golden Jubilee Publication; 2004. p. 308-34. 3. Kumar R, Tripathi P, Singh S, Bannerji G. Clinical features in children hospitalized during the 2005 epidemic of Japanese encephalitis in Uttar Pradesh, India. Clin Infect Dis 2006;43:123-31. 4. White NJ, Breman JG. Malaria and babesiosis. In: Isselbacher KJ, Braunwald E, Wilson JD, Martin JB, Fauci AS, Kasper DL, editors. Harrison's Principles of Internal Medicine. 13 th ed. New York: McGraw-Hill Inc.; 1994. p. 887-95. 5. Burke DS, Nisalak A, Ussery MA, Laorakpongse T, Chantavibul S. Kinetics of IgM response to Japanese encephalitis virus in human serum and cerebrospinal fluid. J Infect Dis 1985;151:1093-9. Bhatt, G.C. and Sharma, T.
Arya, S.C. and Kalra, N.L.